iCCnet CHSA is fully aligned with the principles, aims and objectives of The Health Reform Process in South Australia. 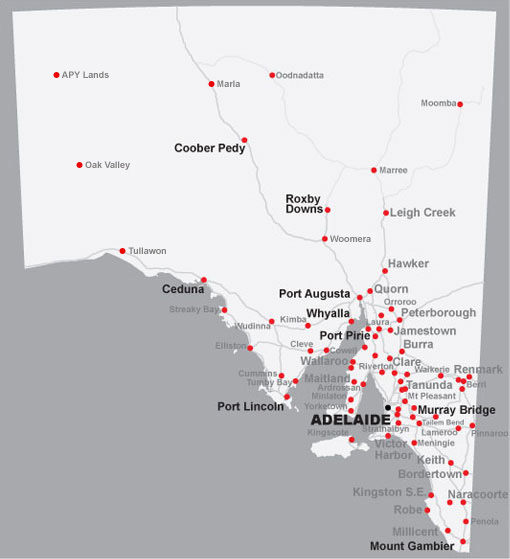 The network includes over 70 hospitals, health centres and GP surgeries across South Australia. To provide a state-wide provider clinical network which supports the practice of evidence based medicine and continuous quality improvement in the management of cardiovascular disease across regional, rural and remote South Australia. Updated Management of Chest Pain/Suspected ACS protocol is available in the 'Clinical' tab. Registrations CLOSED! Head to the 'Meetings' tab for further details. A new video promoting our Home Monitoring program is available for viewing. Recordings are available by clicking on the 'Clinical' tab. Troponin PoCT Recommendations are available by clicking on the 'Point of Care Testing' tab. Recording & Slides are available by clicking on the 'ECG/MUSE' tab. Cardiac drug protocols are available in the 'Clinical' tab.